After practically a full day's worth of research and not wanting to drive around in the pouring rain on my day off looking for a chair (and probably dropping too much money on one because, frankly, I crack under the pressure of an aggressive salesperson), I found this: Office Star's Professional Light Air Grid Back Chair with Eco Leather Seat. 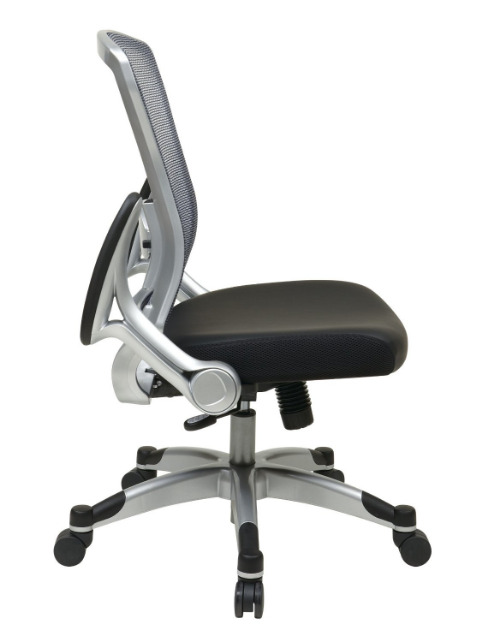 It has the adjustable lumbar support, flip up arm rests, and adjustable seat. It looks pretty sleek too. I also kept my budget goal. I saw this chair in places for quite a bit more, but you couldn't beat Amazon.com's price of $207 with free shipping. It should arrive right around the Fourth of July where I'm taking a 4 day weekend. I'll be painting diligently that weekend and will no longer be subject to the $25 IKEA Chair of Shame.